Just picked my last leeks and only have a little kale left, so with the 2012 growing season basically over it seems like a good time to assess the year. The good, the bad, and the ugly. It looks like this is going to take a number of posts so keep an eye out for more. Cilantro can go to seed and still taste just as good as it does when it’s small. 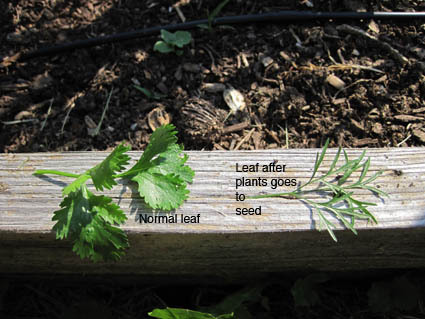 The leaves on most plants get bitter when they start to go to seed, but not cilantro. An advantage of allowing the plants to go to seed you wind up harvesting a ton of cilantro or you can plant less and still get the amount you want. The leaves on the plant will change shape when the plan goes to seed but both types if leaves are OK to harvest. If you want to preserve this bounty of cilantro the best way to do so is to chop it up in a food processor, stuff it into ice cube trays, and pour on a little water. 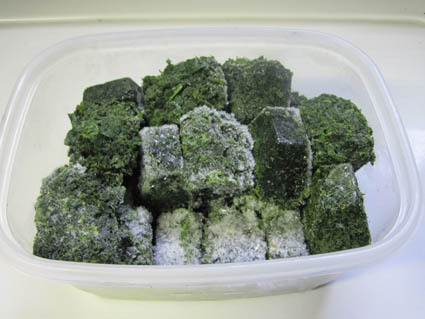 Once frozen, just pop the cubes into a Ziploc or other freezer container. This method also works well for most herbs. It preserves the flavor better than drying, especially for subtle herbs like parsley. Another advantage of letting the plants go to seed is to harvest the seed for future plantings or as a spice. The seed of cilantro is the spice known as Coriander, a staple spice in many Asian cuisines. When you’re harvesting the seed, a lot will fall into the garden and sprout later in the season giving you a second crop and some will probably sprout next year too. If you get enough seed, it makes a nice stocking stuffer, in little baggies or other small containers for the gardener or cook on your list. If you let your cilantro go to seed, don’t let all of it do so. The plants get about 3 ft tall and are fairly bushy so they can shade out some of the smaller veggies you’re probably growing nearby. 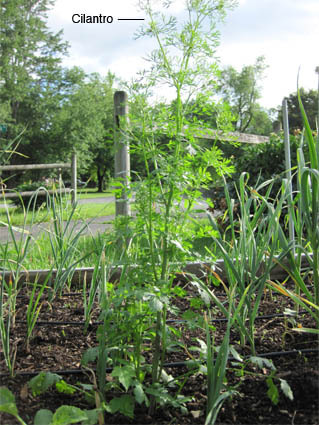 Whatever cilantro you allow to mature will need to be staked or given other support or they’ll flop all over the garden. Finally, I discovered that Cilantro is quite frost-hardy. My fall crop had already survived a few mild frosts , when there was a frost predicted in the mid-20s. I ran out to the garden in the dark to rescue whatever cilantro I could. The next morning it was all frozen, but later in the day it thawed out and was fine and even survived a few more frosts. As I mentioned in my last post, I tried making tomato leathers this fall to deal with another really good harvest (despite blossom-end rot and late blight problems- more on the latter later). I did it with all of my standard tomato recipes: Roasted Tomato Sauce, Salsa, BBQ sauce, and Tomato Paste. The tomato sauce and tomato paste leathers are absolutely fantastic. The BBQ leather I haven’t really decided about and the salsa I probably won’t do again. 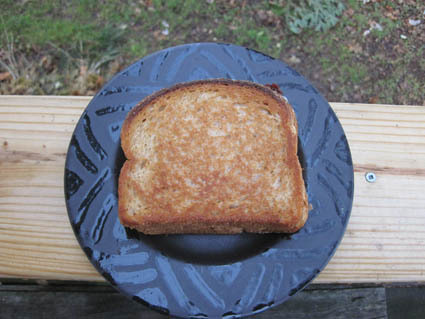 I use the tomato sauce leather on grilled cheese sandwiches and it’s amazing! I also wanted some tomato sauce one day but didn’t have any unfrozen, so I just took some of the leather and reconstituted it with water. I’ve used the tomato paste leather like sun-dried tomatoes or in dishes where tomato paste is called for. If using the leather like tomato paste, you either need to add some water to the recipes or add bits of leather into the dish when you’re sautéing the veggies so the leather can absorb some of the water being released. 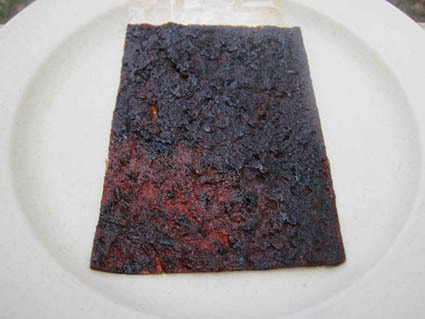 To make a tomato leather you’ll need a dehydrator or convection oven with a “dehydrate” setting (that’s what I have). You can try a conventional oven set on it’s lowest setting but this may not work very well from what I’ve read. Prepare the recipe just as if you were canning or freezing. At the point when the recipe would be ready to put in jars or freezer containers, cover two of your dehydrator or convection oven pans with plastic wrap and pour the sauce evenly on top, spreading with a knife if you need to. Place the pans in your apparatus, turn it on and wait 12-18 hours, or until the sauce is dry to the touch and a bit stiff. If there’s a lot of oil in the recipe, like in my Roasted Tomato Sauce, the leather will be softer than other types. The trays for my oven are ~ 9”x12” so the 2 tray method is based on that size. If your trays are a different size, adjust accordingly. According to the directions and my experience you can store the leathers at room temp. I had a bit of mold form on one leather (I just cut off that section and used the rest) but I think I just didn’t dry it enough. I’ve had the leathers at room temp for 2-3 months with only that one problem. 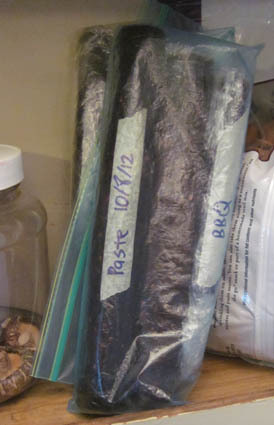 To store the leathers, I just roll them up in the plastic wrap (wrap side out) and place them in Ziploc bags. I discovered, however, if the tomato sauce leather is stored that way the oil will ooze out the sides and make a mess. So in that case I cut the leather into 8 sections (it the perfect size for my grilled cheese sandwiches), keeping it on the plastic wrap and then I lay it flat in a hard-sided storage container. In the next post: My Cold-frame.